The deadline for submission of the CME Application Form has passed. For assistance please contact Tara Snethen at [email protected]. 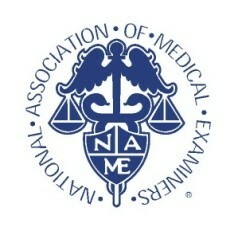 This activity (“National Association of Medical Examiners 2018 Annual Meeting”) has been planned and implemented in accordance with the Essential Areas and policies of the Accreditation Council for Continuing Medical Education (ACCME) through the joint providership of MedChi, The Maryland State Medical Society and the National Association of Medical Examiners (NAME). MedChi is accredited by the ACCME to provide continuing medical education for physicians. MedChi designates this “live” educational activity (“NAME 2018 Annual Meeting”) for a maximum of 32.25 AMA PRA Category 1 Credit(s)™. Physicians should only claim credit commensurate with the extent of their participation in the activity. The objective of the NAME 2018 Annual Meeting is to increase basic and applied pathology knowledge, focusing on autopsy and forensic pathology. The NAME 2018 Annual Meeting is designed to meet the participants’ education needs in the physician competency area of Medical Knowledge, as defined by the Accreditation Council for Graduate Medical Education (ACGME) and the American Board of Medical Specialties (ABMS), and to support participants’ lifelong learning towards a goal of promoting patient safety and improving patient care and is specifically targeted to forensic pathologists, medical examiners, coroners, death investigators, forensic administrators, pathology assistants, laboratory personnel engaged in forensics, and forensic scientists. discuss forensic science approaches to sudden death in children and adult populations. In order to ensure balance, independence, objectivity and scientific rigor in all its educational activities, and in accordance with ACCME Standards, MedChi requires that all individuals in a position to influence and/or control the content of MedChi CME activities disclose to MedChi and subsequently to learners whether they do or do not have any relevant financial relationships with proprietary entities producing health care goods or services that are discussed in CME activities. Faculty are asked to use generic names in any discussion of therapeutic options, to base patient care recommendations on scientific evidence and to base information regarding commercial products/services on scientific methods generally accepted by the medical community. All MedChi CME activities are evaluated by participants for the presence of any commercial bias and thus input is used to subsequent CME planning decisions. The primary purpose of this “live” CME activity is educational and the comments, opinions, and/or recommendations expressed by the faculty or authors are their own and not those of MedChi or NAME. Planning Committee Disclosures: The Education, Program and Publications (EPP) Planning Committee members and staff of this CME activity have no relevant financial relationships with commercial interest to disclose.